I think there is a ‘fluid’ as well as a ‘solid’ content, that some poems may have form as a tree has form, some as water poured into a vase. That most symmetrical forms have certain uses. That a vast number of subjects cannot be precisely, and therefore not properly rendered in symmetrical forms. Written at a time when free verse was a relatively new and exciting development in English language poetry, Pound’s metaphor was a brilliant piece of polemic. 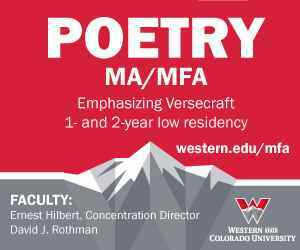 While allowing that “symmetrical forms” such as sonnets and villanelles and rhymed quatrains had “certain uses,” it suggested that a modern poet would be wise to render most of his subjects in the more flexible, organic form of free verse. A vase might possess a pure, if somewhat abstract and fragile, beauty; but it is, after all, a human artifact–cold and unliving, a relic from the dusty museum of the past. Water poured into it must necessarily conform to its pre-existent shape. Pound’s metaphor has other implications for “symmetrical form” as well, almost all of them negative. For instance, didn’t Keats write in a letter to John Taylor, “That if Poetry comes not as naturally as the Leaves to a tree it had better not come at all”? Leaves are the natural outgrowths of trees, but can a leaf grow from a vase? The form is mechanic when on any given material we impress a predetermined form, not necessarily arising out of the properties of the material, as when to a mass of wet clay we give whatever shape we wish it to retain when hardened. The organic form, on the other hand, is innate; it shapes as it develops itself from within, and the fulness of its development is one and the same with the perfection of its outward form. To a modern poet, the act of pouring poetic content into a vase-like “predetermined form” seems every bit as mechanical, and even less original, than pressing clay into a vase. Even considering the sacramental, mystical qualities attributed to water, one can’t help thinking of the parable of the wine skins. As a result, writers of free verse from Pound to the present have argued that for poetry to be organic, it must be unbound by the mechanical regularity of meter and the formal rules and strictures of traditional poetry. Merely looking at the two types of verse on the page seems to confirm Pound’s intuition. A passage of the late Cantos, or a poem by Charles Olson or A. R. Ammons, sprawls down the page with the scraggly branchiness of an oak tree, or zig-zags from margin to margin like tide and shore. The shape of formal verse, on the other hand, is suggestive of lines, planes, squares, and stacked boxes. Its kinship to Pound’s vase seems obvious. Thirty years have passed since Ammons published “Corson’s Inlet,” and in that time, discoveries in science and mathematics have shed new light on the problems discussed in his poem–discoveries with immense significance for our understanding of form and content, nature and art, organic and mechanical form. In retrospect, Ammons’ use of the phrase “not chaos” in his description of the swallows’ behavior is startlingly prescient because, in fact, a whole new science of chaos–or “anti-chaos,” as it’s sometimes called–has come into being precisely to explain such phenomena. Surprisingly, though, what the new sciences of chaos and complexity have shown is that Ammons is wrong in his conclusions about art and nature: that the “rule” of nature is not the sum of “rulelessness,” as he proposes, but is clearly derived from formal rules and principles, which can be described and even imitated by a new form of mathematics called fractal geometry. Thanks to these new discoveries, we now know that the “order tight with shape” he observes in a tiny snail shell is the same order seen in “the large view”: in coastlines, weather systems, sand dunes, mountain ranges, and galaxies. That the laws governing the growth of trees–as well as of leaves, ferns, pine cones, and sunflowers–is the same law that governs the growth of human organs, snowflakes, tornadoes, bird wings–and, I will argue, the elegant, broken symmetries of formal verse. It turns out that writing formal poetry is not at all like pouring water into a vase, but, rather, like the growth of a tree–far more so than writing free verse, which, except in special cases, is too ruleless, arbitrary, and mechanical to produce the organic integrity of a good sonnet. Let’s begin by considering those flocking swallows. 2. . . . to match velocities with boids in its neighborhood. 3. . . . to move toward a perceived center of mass of boids in its neighborhood. What was striking about these rules was that none of them said, “Form a flock.” Quite the opposite: the rules were entirely local, referring only to what an individual boid could see and do in its own vicinity. If a flock was going to form at all, it would have to do so from the bottom up, as an emergent phenomenon. And yet flocks did form, every time. Reynolds could start his simulation with boids scattered around the computer screen completely at random, and they could spontaneously collect themselves into a flock that could fly around obstacles in a very fluid and natural manner. Sometimes the flock would even break into subflocks that flowed around both sides of an obstacle, rejoining on the other side as if the boids had planned it all along. . .
Ironically, though, by rejecting the rules of formal poetry, Ammons is not, as he declares in the poem, leaving “all possibilities / of escape open,” but rather cutting himself off from the possibility of achieving the types of rule-governed behavior that produce nature’s emergent forms. Once we look at how poems actually take shape, it becomes clear that Ammons and Pound are wrong: The rules of formal poetry generate not static objects like vases, but the same kind of bottom-up, self-organizing processes seen in complex natural systems such as flocking birds, shifting sand dunes, and living trees.
. . . my practice is absolutely the reverse of saying, well let’s write a sestina now, let’s see if I can write a roundeau. I’ve never, never found myself doing that kind of thing. It’s always a matter of sensing that something wants to be said, something of which, as yet, I have a very imperfect knowledge, and letting it start to talk, and finding what rhythm it wants to come out in, what phrasing seems natural to it. When I’ve discovered those things for a couple of lines, I begin to have the stanza of my poem, if I’m going to have a stanzaic poem. In any case, the line lengths declare themselves organically as they do, I suppose, for a free verse poet. The difference between me and a free verse poet is simply that I commit myself to the metrical precedents which my first lines set. I have found that though I don’t know how a poem is going to end, I always have a pretty good advance awareness of how long the poem is going to be, what its tone is going to be, and thus can initially arrive at rhythms and line lengths which are going to be capable of repetition without troubling the flow of thought as it emerges. As soon as the temperature difference between the bottom and the top of the container reaches a critical point, the convection cells bubbling chaotically from the boundaries of the container self-organize themselves so that a symmetry hidden in the chaos asserts itself. The photograph accompanying his description shows a beautiful pattern of hexagonal convection cells, packed together like the beeswax cells of a honeycomb. The sudden appearance of this beautiful geometrical arrangement is completely unpredictable and results from nature’s surprising ability to self-organize holistically, through a complex and sensitive system of feedback, into an emergent new form. As Wilbur describes it, the way a mass of bubbling chaotic thoughts and scattered phrases turns into a sonnet or villanelle is very similar to the seemingly magical transformation that occurs in heated silicon oil. Writing a sonnet, it turns out, is less like pouring water into a dead clay mold than like heating water and watching it suddenly self-organize into a vase. The term scientists now use to describe the complex, elegant patterns that emerge from nonlinear dynamic systems is “strange attractor.” The honeycomb pattern emerging from heated silicon oil is one; a tornado organizing itself from random atmospheric turbulence is another. Completely unpredictable from the behavior of its constituent parts, a strange attractor is a higher-order, emergent phenomenon. Like the flocking behavior of real birds and computer “boids,” it somehow spontaneously happens when a simple set of rules, interacting in a holistic way throughout a complex system, produces a dynamic new form of order. From the testimony of Richard Wilbur and other poets, it appears that a poem begins with a “something that wants to be said” that generates random phrases and rhythms that organize themselves into lines, then shapely stanzas, then poems. Wilbur says he doesn’t decide ahead of time what the line lengths will be, but, rather, that they “declare themselves organically.” Yet, paradoxically, these initial lines declare themselves into the right lengths because of his dim initial awareness of “how long” and of what the overall “tone” of the poem is going to be. The initial lines determine the shape of the finished poem, yet the overall shape and tone of the finished poem is what draws the initial lines into being. Borges suggests that the sonnet was an “archetypal thing,” a strange attractor that somehow caused those first quatrains and triplets to self-organize by reaching back through time: “. . . a strange slight music shed / From time coming and its holy dread / A murmuring of far-off nightingales.” Borges’ final image of an “avid crystal”–or “whirlpool mirror” in Ferguson’s translation–is another apt description of the “strange attractor” that pulled myth, riddle, paradox, and labyrinth into the sonnet’s equally tangled form. The spirit of poetry, like all other living powers, must of necessity circumscribe itself by rules, were it only to unite power with beauty. It must embody in order to reveal itself; but a living body is of necessity an organized one–and what is organization but the connection of parts to a whole, so that each part is at once end and means! This is no discovery of criticism; it is a necessity of the human mind–and all nations have felt and obeyed it, in the invention of meter and measured sounds as the vehicle and involucrum of poetry, itself a fellow growth from the same life, even as the bark is to the tree. The error made by Pound and Ammons is a common one. Like many a contemporary theorist, they saw the shapes that formal poems make on the page, noted their resemblance to Euclidean squares and rectangles, and concluded that they were produced by a different geometry than that which produces the biomorphic shapes of trees and leaves. They mistook the two-dimensional outline of the poem on the page for the shape of the poem itself–which, as Pound said more wisely in another famous aphorism, is a shape cut “into time.” In confusing a poem’s two-dimensional outline with the four-dimensional shape it creates when spoken or read, poets like Pound and Ammons resemble the citizens of Flatland in the classic novel who see only a two-dimensional cross-section of a multi-dimensional object when it intersects the flat plane of their universe. Like his predecessor Charles Olson, who also composed on a typewriter and thought in spatial terms, Ammons tries to substitute a typewriter’s mechanical spacing for the organic coherence produced by rules and “measured sounds.” Ammons once even composed an entire book-length poem, Tape for the Turn of the Year, on a roll of adding-machine tape, letting its narrow dimensions mechanically dictate the form and rhythms of his poem. Now, thanks to a new tool, the computer, and a new type of mathematics, fractal geometry, we know that time plays a role in the evolution of nonlinear dynamic systems. We can express the rules governing complex natural systems such as sand dunes and coastlines and measure their shapes in precise mathematical ways. Using fractal geometry, we can even assign a shape like a coastline a fractal dimension (The coast of England, for example, has a fractal dimension of 1.25). We now know that the shapes of trees and leaves are not the sums of “rulelessness,” as Ammons proposed, but the result of a rule-governed process dictated by their DNA and feedback from the environment as they adjust themselves in an endless feedback loop. Like growing leaves and changing coastlines, the nonlinear equations of fractal geometry need time to enact their iterations. Unlike linear equations, which simply plug numbers in and calculate the answer to a result, nonlinear equations feed the results of each step back into themselves, altering themselves and their outcome through constant feedback, and thus creating a perfect mathematical analog to the processes undergone by living things. For instance, one of the simplest types of nonlinear equations is the Fibonacci sequence. Starting with the number 1, the sequence then progresses to 1, 2, 3, 5, 8, 13, 21, 34, so that each number is the sum of the two preceding it. The approximate ratio of each number to the preceding one is .618. . . , the number of the golden section. The poet John Frederick Nims in his book Western Wind finds this ratio in the proportions of the Golden Rectangle, and demonstrates how when the Golden Rectangle is subdivided into smaller and smaller versions of itself, and connected by a curving line through corresponding points, it produces the spiral found in a nautilus shell–one of those small forms “tight with shape” Ammons mentioned in “Corson’s Inlet.” The same golden section ratio can also be found in other natural objects such as the spiral of sunflowers and the curve of mountain goat horns. Nims has even speculated that the ratio in the Golden Section might lie behind the proportions of the Petrarchan sonnet, giving further support to Borges’ suggestion that the sonnet is an “archetypal thing” discovered by a Tuscan poet in the thirteenth century. Interestingly, the Fibonacci sequence was discovered by another thirteenth century Italian, Filius Bonacci. But the perfect symmetry of the nautilus shell is clearly of a different type than that of leaves and trees, not to mention clouds and coastlines. That’s because the nonlinear equation that produces the Fibonacci sequence lacks the element of chance provided by environmental feedback to a tree or a boulder-strewn beach. But as John Briggs and F. David Peat note in their book Turbulent Mirror, “…when a random variation in the iterations is allowed so that details vary from scale to scale, it’s possible to mimic the actual forms and structures of nature much more closely. This suggests natural growth is produced through a combination of iteration and chance.” They go on to show that by “combining an iterative scaling with a random element of choice,” the shapes of mountains and coastlines can be generated so realistically on computers that they’re now used in movies and videos. A landscape similar to Corson’s Inlet can now be generated on a computer screen. Fractal scaling, another element common to both natural forms and fractal geometry, is the tendency of a fractal shape to be self-similar at various scales. For instance, the shape of a coastline remains the same no matter what the distance of the observer, whether he’s a passenger on a jet, a mountain climber, a beach stroller, or child with a magnifying glass. Biomorphic shapes such as trees and leaves also display self-similarity at different scales: it’s found in the fractal branching of limbs and twigs and in the vascular branching of its leaves. Another thing that causes the symmetry of natural forms to be irregular is the fact that some incorporate several fractal scales in their designs. For instance, human lungs have one fractal dimension for the first twenty branches, then a different scale after that. As we’ve seen, the shape of a living thing such as a leaf is produced when the instructions coded in its DNA encounter chance elements such as wind, sun, heat, cold, and disease. Using a similar combination of coded rules and random elements, a mathematician named Michael Barnsley has invented a way to create remarkably leaf-like structures through a process he calls “affine transformations.” As Briggs and Peat describe it, the process begins by shrinking and skewing the picture of a full-size leaf into “…a smaller distorted version of the original. The affine idea is to find several of these smaller leaf transformations that can be overlapped into a collage that has the shape of the original full-size leaf.” After shingling several of these small distorted versions of the leaf together, Barnsley starts at a point on a computer and, “using his affine transformations and iteration. . .generates a fractal attractor that looks like the original leaf.” Using a similar method (Barnsley calls it “collage theorem”), he has also created various computer-generated shapes of living ferns. The poet Gerard Manley Hopkins, another astute observer of nature, seems to have discovered “collage theorem” on his own more than a hundred years before Barnsley. In his Journal entry of July 19, 1866, Hopkins describes what sounds awfully like the “affine transformations” for an oak leaf when he writes: “I have now found the law of oak leaves. It is of platter-shaped stars altogether.” Hopkins also seems aware of other shaping principles in nature such as self-similarity and fractal scaling. Writing in his Journal again (July 25, 1868), he compares the shapes of clouds to patterns seen in fungus: “From the summit the view on the Italian side was broken by endless ranges of part-vertical dancing cloud, the highest and furthest flaked and foiled like fungus and colored pink.” Benoit Mandelbrot, the inventor of fractal geometry, in his rhapsodic description of the fractal shapes of nature, practically echoes Hopkins’ poem “Pied Beauty” when he writes of the “. . . grainy, hydralike, in between, pimply, pocky, ramified, sea-weedy, strange, tangled, tortuous, wiggly, whispy, wrinkled” shapes that can now “be approached in rigorous and vigorous fashion” through his fractal geometry. If we substitute the assonantally chiming word fractal for dappled in the first line of Hopkins’ poem (“Glory be to God for fractal things”), its celebration of all that’s “fickle, freckled (who knows how? )” sounds, in turn, remarkably like Mandelbrot. What we are beginning to see, I hope, is that the laws governing the evolution of living and other natural forms are the same laws that govern the creation of poetry. So let’s summarize what these laws are and show how they apply. First, symmetrical forms such as sonnets, villanelles, and ballad stanzas are not static “received forms”; they evolve, like plants, through a process of iteration and feedback. The regular meter of formal poems is not a dull mechanical ticking, like a clock’s; it coalesces out of the rhythms of randomly jotted phrases through a process of “phase-locking”–a natural process that occurs, in the words of Briggs and Peat again, “when many individual oscillators shift from a state of collective chaos to beating together or resonating in harmony.” As two examples, they describe the way the randomly flickering lights of fireflies become synchronous throughout a whole tree, and the way the menstrual cycles of women living in close proximity often phase-lock into a single, collective rhythm. Regular meter is also a source of feedback, another element of organic form. Once the random phrases and rhythms in a poet’s scattered fragments begin to phase-lock into a recognizable meter, every subsequent line must take a similar form. During the composition of a metrical poem, the poet is often forced to rearrange and substitute words till the meter feels right. And when the meter begins to feel too regular, he will allow some random variations to occur, or consciously add substitutions, to reshape a line. Rhyme is another attribute of formal poetry that increases feedback by forcing the poet to listen to what she writes. Each time it sends a poet to her rhyming dictionary, it adds an element of randomness–the way weather influences the growth of a tree. To fit the new rhyme into her scheme, the poet often has to invent new metaphors and introduce new ideas, thus altering the course of the entire poem. Furthermore, once the rhyme-scheme becomes clear to the poet in the early lines, it affects the development and arrangement of every future line as the poem evolves toward its final form. In addition, rhyme prevents a poem from being merely a linear succession of so-called “breath units” scored on a two-dimensional plane. By reaching back to earlier rhymes and forward to future rhymes, each new rhyme twists the entire poem back on itself in a self-interfering knot. A formal poem is also holistic. One alteration in a line’s meter or rhyme scheme affects the writing, interpretation, and affective value of every other line. The self-similarity of fractal scaling is another element shared by formal poetry, natural forms, and fractal geometry. We can see it in the scaled, fractal branching of the human circulatory system and in the identical paisley patterns seen at different scales of a purely mathematical object like the Mandelbrot set. The same self-similarity and scaling occur in formal poetry. Frederick Turner has found what might be the most remarkable use of self-similarity in all of literature in Dante’s Divine Comedy, in which, Turner writes, “. . . the three line stanza of its microcosm is echoed in the trinitarian theology of its middle-level organization and in the tripartite structure of the whole poem.” Narrative poems such as the Divine Comedy and the Aeneid of Dante’s master, Virgil, offer additional levels of fractal scaling as episode branches into episode, creating eddies and turbulence that both contribute to and resemble the larger narrative movements of the poem. The reason natural forms such as trees and leaves rarely display the perfect symmetry of a nautilus shell or the Mandelbrot set is that their forms possess what scientists call “broken symmetry,” also described as “similarity with a difference.” Here again, we can find a parallel in formal poetry, wherein no two metrical lines are ever identical. Metrical substitutions are one source of asymmetry; but even when no variations occur, subtle differences of stress and duration will make any two lines as different as two snowflakes. There is also a symmetry-breaking tension in the subtle differences between a line’s abstract metrical pattern and the speech rhythms playing against it. Rhyme is yet another source of “similarity with a difference,” since by definition it’s produced by words compounded of both similar and dissimilar sounds. Finally, we must consider the emergent features which appear in all kinds of dynamic nonlinear systems, from trees to poems. One such emergent feature is beauty. Though Joyce Kilmer claims never to have seen “a poem lovely as a tree,” others have found in poems an equal, or surpassing, beauty. Poems not only share the wild, inexplicably beautiful proportions of natural forms, they also engage our minds and perceptions at higher levels, mirroring our moral and intellectual complexities. They have the power to move and transform us. Consider the following poem by Charles Martin, which illustrates much of the above. The poem opens with two lines of carefully interwoven vowels and consonants, alliterating “seeds” and “certain”; “grass,” “grew,” and “graves.” This interlocking mesh of sounds is echoed at higher levels in the metrical rhythms holding individual lines together and binding all of them into a collective unity; it’s repeated again in the four strenuously discordant off-rhymes which lock each quatrain into place and make each stanza resemble the others in form and structure. The first stanza introduces the extended metaphor that will be elaborated throughout the rest of the poem, telling how the seeds of grasses that once grew “Over the graves of those who fell at Troy” were introduced into the New World. By using his metaphor of grass, the poet is able to show not only similarities between the conquest of Troy by Greeks and New World natives by Europeans, but to echo both conquests at a lower level in the war between species of grass. The metaphor enables the poet to set all the historical events against the much vaster scale of evolutionary time, with its vast cyclic movements of Darwinian struggle, adaptation, and mass extinction. With each stanza, the metaphor complexifies and deepens, so that by the time the poem describes the native flowers bowing to the “dominion” of the new grasses and retreating toward “ledges of serpentine,” we can’t help but think of the devastation and gradual retreat of Native Americans into those badlands called reservations. The chilling similarities evoked by the metaphor are echoed in the violent chiming of the poem’s off-rhymes, as well as in the regularly repeating rhythms of its meter. As the poem expands, its large-scale metaphoric and thematic similarities are mirrored all the way down to the level of individual words as the poet writes punningly of how “blade fell upon flashing blade,” where sword and grass, men and nature, are reflected in a single monosyllable. After the personification of the earlier stanzas, the final stanza comes as a shock. Speaking of the defeated native grasses, the poem declares, “They were like men who see their city taken, / And think of grass–how soon it will conceal / All of the scattered bodies of the slain . . .” thus creating a tangled loop reminiscent of M. C. Escher: The native grasses are like men who, in defeat, think of how grass will cover their dead (human) bodies. A further tangling of levels occurs when we consider the food chain the poet secrets into the poem: the grass seeds arrive in the hooves of cattle; cattle eat grass; men eat cattle; when men die, they are eaten by grass; which is eaten by cattle; and so on to infinity. Switching from the implicit comparison of metaphor to the explicit comparison of simile (“They were like men who see their city taken” [italics mine]), the poet is able to spring a sudden reversal in the poem’s last line: “As such men fall, these fell, but silently.” That final “similarity with a difference” delivers the poem’s moral shock. Yes, we think, grasses are like men, but they fall silently–without tragedy or conscious suffering, in a world devoid of moral responsibility. In that difference lies a whole universe, filled with all the horror and tragic beauty of our lives. Martin’s deceptively simple sixteen-line poem captures an almost infinitely complex set of nested scales–from the lowest, sensual level of patterned sounds up to the highest level of ethical and moral feelings. In the snow flat-topped hillocks and shoulders outlined with wavy edges, ridge below ridge, very like the grain of wood in line and in projection like relief maps. These the wind makes I think and of course drifts, which are in fact snow waves. The sharp nape of a drift is sometimes broken by slant flutes or channels. I think this must be when the wind after shaping the drift first has changed and cast waves in the body of the wave itself. All the world is full of inscape and chance left free to act falls into an order as well as purpose: looking out of my window I caught it in the random clods and broken heaps of snow made by the cast of a broom. A final poem by Hopkins will illustrate the depth of his understanding and achievement. Published without a title, it is known by its first line. By now, we hardly need to point out how the poem performs itself, joining its various elements in one organic wholeness. We might begin by noting that it’s a Petrarchan sonnet, then observe how the rhyming of the sestet, cdcdcd, contrasts with the envelope rhyme-scheme of the octave–like the shift from one fractal dimension to another in the branching of human lungs. We might also note how the poem’s end-rhymes are echoed in rhymes and thick clusters of assonantally chiming sounds within the lines, and how the lush assonance of the poem finds a parallel in its dense alliteration. Taken together, there’s not a more densely interwoven texture of sound in English poetry. The entire poem celebrates a self-similarity that extends throughout creation, from the distinctive beauty of pebbles and insects, to the higher forms of ethical and moral beauty in people, up to the very highest informing beauty of the creator himself. According to Hopkins, everything from a dragonfly to God not only possesses a distinctive beauty, a special thisness, it selves–a verb, notice, not a noun. This selving is a living process that happens across all levels of being; it is a lived performance. Hopkins declares that the just man “Acts in God’s eye what in God’s eye he is”; that “Christ plays in ten thousand places” [italics mine]. Everything in creation–from “selving” pebbles and dragonflies to the man who “justices” and “keeps all his goings graces”–is tangled in one self-interfering loop. In man, the creative principle–what Hopkins calls God–achieves a transformative self-consciousness, able to act “in God’s eye what in God’s eye [it] is.” A man is not only nature observing itself, but embodied personhood (like the incarnate Christ); he is God observing Himself. The final three lines of the poem capture this self-reflexive, paradoxical entangledness with remarkable beauty and economy: ” . . . For Christ plays in ten thousand places, / Lovely in limbs, and lovely in eyes not his / To the Father through the features of men’s faces.” Christ plays to the creator, who is also paradoxically himself, through the “features of men’s faces,” with their distinctive, character-revealing symmetries and fractal wrinkles. As kingfishers catch fire, dragonflies draw flame . . .
As kingfishers catch fire, dragonflies draw flame. . .
A slight asymmetry is caused by the extra unstressed syllable of “As” and the ghostly extra syllable hovering at the end of fire in the first half of the line, as well as by subtle differences in the stress and duration of corresponding syllables in each. 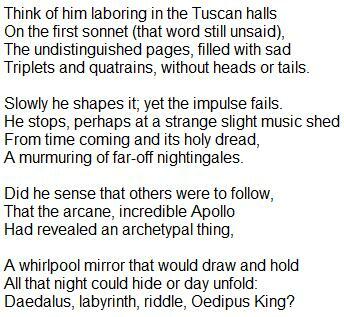 A further asymmetry lies in the way the first line departs from the dominant iambic pattern of the poem. This asymmetry appears again most noticeably in the poem’s last line, which hovers suspended between three almost equally plausible scansions of its rhythms. The line can be heard as extremely loose iambic pentameter, with an anapestic substitution in the first foot, an iamb with a courtesy accent on “through” in the second, a normal iamb in the third, and a pyrrhic and spondee (with a feminine ending) in the last two; as trochaic hexameter, with five of its six feet falling; and as an oddly symmetrical three-stress line composed of three anapests, with an extra unstressed syllable after each. The alliteration of the three heavily stressed syllables in “Father,” “features,” and “faces” lends additional weight to this reading. A similar situation arises in the final line, where, in order to get our five stresses, we have to count either the lightly stressed “To” or “through,” as well as “men’s”–though none receives anywhere near the weight of the stresses in Fathers, features, faces. Within the larger metrical context, however, we can scan the line as above, as loose iambic. If we regard each line as a gestalt, even some of Hopkins’ most difficult lines can be scanned as iambic pentameter–though a pentameter with a higher than usual number of stresses due to his frequent spondaic substitutions. All of which goes to show how holistic a formal poem is, how every line and every individual foot within it affects the reading of every other line and syllable. Though Hopkins substitutes with unparalleled boldness, especially in the sestet, where the lines buckle and strain against the iambic matrix, we have only to compare this poem to others such as “Spelt from Sibyl’s Leaves” or “Carrion Comfort” (both experimental “sonnets” with the same rhyme scheme) to see the difference between it and the poet’s more thorough-going experiments in sprung rhythm. In “As Kingfishers catch fire,” it seems that the sonnet form itself (that archetypal thing) reaches down to influence the reading of each constituent part by awakening expectations in us for certain rhymes and rhythms. Every fragment of syntax, every complication of metaphor influences every other part of the poem in ways both large and small. It is difficult to conceive how a poem without the regularly recurring rhythms or self-repeating forms of Hopkins’ sonnet could produce such complexity of design or richness of interpretation. The structure of poetry is that of continuous parallelism, ranging from the technical so-called Parallelisms of Hebrew poetry and the antiphons of Church music up to the intricacy of Greek or Italian or English verse.